Open Happiness. Catch the Wave. The Coke Side of Life. Life tastes Good. Coca-Cola has used dozens of slogans over the years. They’ve executed tons of campaigns and created millions of beautifully designed print ads and billboards. Coke is known for constantly evolving, being innovative and using new technology to make amazing work. One of their more recent campaigns, however, is so simplistic, so basic in nature, that it seems more memorable than the extravagant, over-the-top campaigns that they’re used in the past. That’s because this campaign had a big idea. Coke wanted to encourage people to “share” with each. Share a moment of happiness. The company swapped the tradition logo on their sodas, and customized Coca-Cola, Diet Coke and Coke Zero bottles with over 250 of the most popular names from Australia and the United Kingdom. 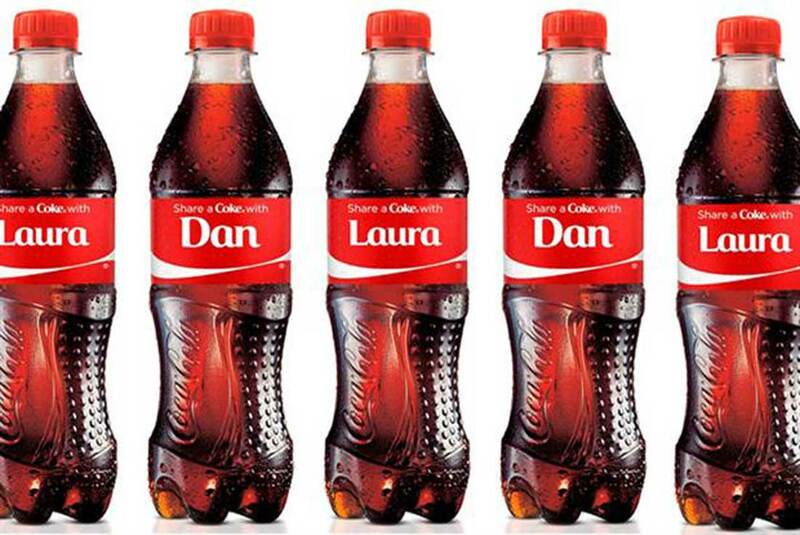 Using first names was a simple and effective way to bring people together and encourage them to not only find bottles with their own name on it, but also bottles with their friends’ name on it! It became an exciting scavenger hunt and bonding activity. People couldn’t wait to get their hands on a personalized bottle of Coke! Coke bought print, Billboard and bus advertisements to promote the initiative. They took advantage of holidays, promoting the special “Dad” bottle for Father’s Day and hired a team to tour around different towns, cities and selected supermarkets across the UK during July and August of 2013 to personalize more than 350,000 bottles! 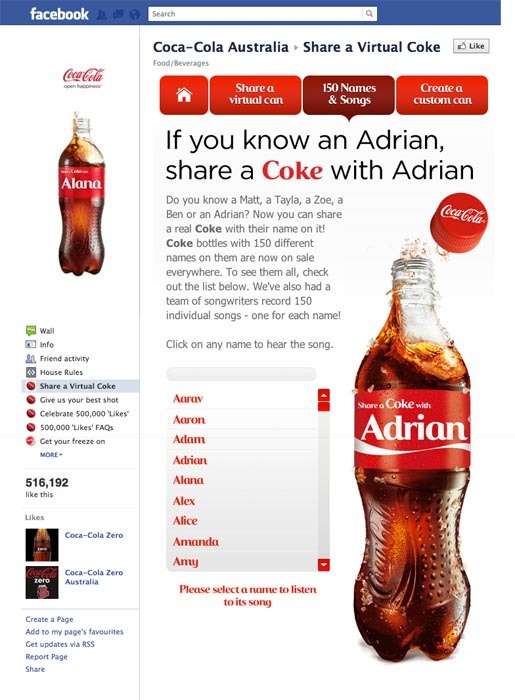 The campaign also had a digital aspect, as customers were asked to “share” pictures of bottles with their names on them and tweet to @cokezone using the hashtag #shareacoke. 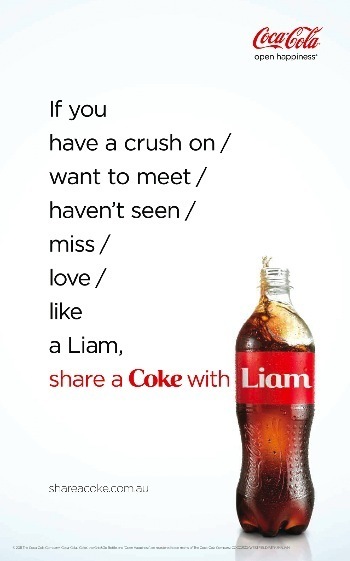 People could also give a virtual Coke to friends and family via Facebook! Check out a recap of the campaign in Great Britain. In the UK, Coca-Cola’s value sales increased 4.93 per cent year on year to £765 million in the 52 weeks to 17 August, according to IRI Worldwide data. Sales of all colas in the UK grew 2.75 per cent, all carbonates 3.11 per cent and the total soft drinks market’s value sales increased 2.36 per cent in the period. In Australia, young adult consumption increased significantly during the campaign, up by 7%, making 2011 the most successful summer ever. The campaign earned a total of 18,300,000-plus media impressions. Traffic on the Coke Facebook site increased by 870% and the Facebook page grew 39%. In Australia, we were the number one most talked about Facebook page and 23rd globally. The campaign also changed attitudes, brought people together and put Coke in the front of consumers’ minds. And it all started with one simple word. Share. Moral of the story. K.I.S.S. Keep it simple, stupid.